In our First Look at the Carbine 29 we remarked at how refreshingly clutter-free Intense made the handlebar on this bike. No suspension lockouts, no electronics, no front shifter—and only a single clamp on each side, due to judicious use of SRAM’s Matchmaker hardware. Essentially three buttons, two levers and a whole lot less on the brain. Beautiful. That said, we now feel the Carbine 29 should probably come with one more control—an Easy Button, because that’s how it feels to ride this bike. Whether bombing descents, huffing up long climbs or taking it airborne, our test riders found the Carbine a comfortable, easy whip to command. And while a couple of the 29ers in our test instill similar confidence, they do so by more-or-less muting-out the bike. The Intense, on the other hand, manages to instill a sense of self-assurance while still keeping things exciting. It should come as no surprise that the Carbine Pac-Mans chunky downhill terrain. Its 29-inch wheels combined with 140mm of Virtual Pivot Point (VPP) commanded rear suspension in combination with a buttery smooth RockShox Pike 160mm-travel fork gives the bike a luxurious but responsive ride quality. What did surprise, however, was what happened when the Carbine left the ground. Equally surprising was the way the Carbine 29 climbed. At 28 pounds, the Intense is respectable for its gravity-biased ambitions, but not a lightweight. On long ascents the Easy Button analogy again comes to mind as the bike pedals with a certain lightness and efficiency. It’s not at-the-front-of-the-pack speed, but its right there in the second group ahead of all the other big bikes, and without all the whining. The Carbine 29 shines on technical climbs as well, charging up and over rock gardens, big logs and other “no way” obstacles like Godzilla stomping out Japan—the attack angle-limiting wheels working in tandem with the supple suspension to claw spin and lift over the gnar. Once you trust the bike enough to keep pedaling in the face of iffy-ness, the Carbine rewards you with pull-through. Having looked at the Carbine’s specs the night before our test, one of our riders determined that the bike’s long wheelbase and chainstays should result in a stable but poor maneuvering ride. Indeed, the Carbine both looks big and puts big numbers up on the spec sheet, but what that test rider—and the other six-foot-or-taller riders who signed up to ride the bike—didn’t realize is our Intense was actually a medium-sized frame, not large as they had presumed. 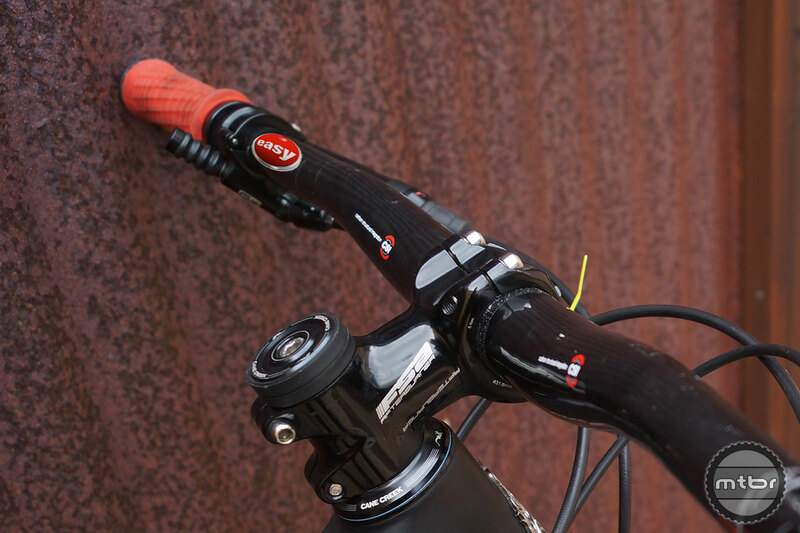 A well-hidden grey-on-black frame decal indicating its size went unnoticed, tricking the riders into riding a frame size they normally wouldn’t consider. More than that, the misread ended up being a blessing in disguise. While both bikes have a longish 17.75-inch large chainstay length, the wheelbase of the medium Carbine 29 is 46-inches, a full inch shorter than its size large brethren. While the large’s 47-inch wheelbase would have been the longest, and theoretically most unwieldy, in our entire test, the medium is about average for the 29ers and is actually shorter than a few of the 27.5-inch bikes. On the trail, it made for a maneuverable ride. Since when are 740mm bars narrow? Must have missed that memo. 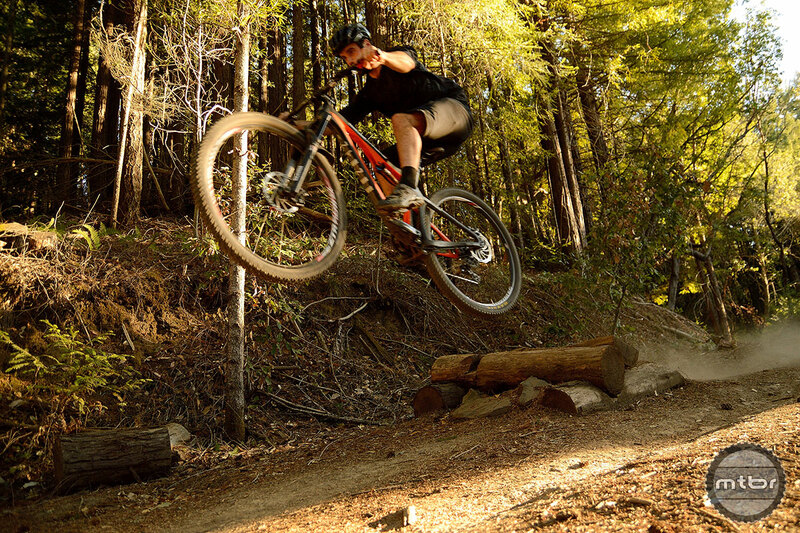 TJ- Bars are getting wider all the time, and though it used to be a DH fanboy fad, those of us riding all-mountain and trail bikes–particularly 29ers–are finding wider bars help with leverage when steering, making the bike slightly easier to press into turns. All the reasons you listed, are exactly why I built one of these. 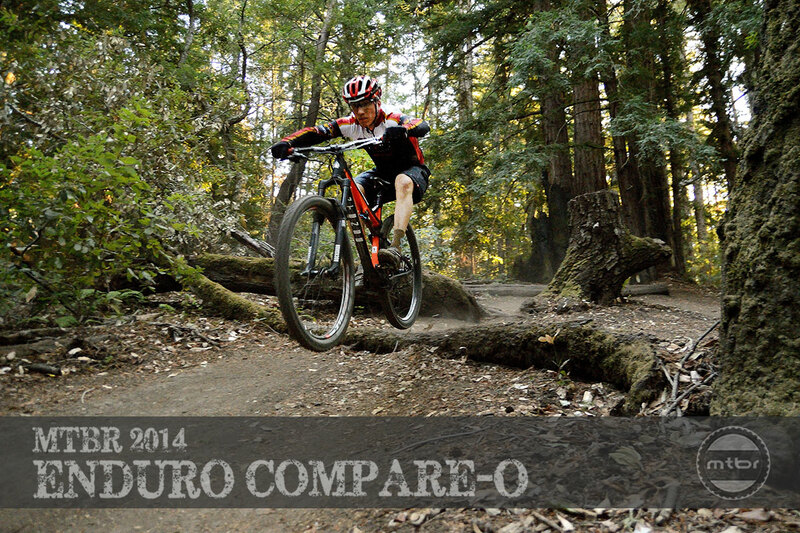 It climbs better than my previous 4″ 29er, and descends closer to my 6″ El Guapo. The only drawback is that the lower pivot pretty much eliminates the ability to run a 2x chain guide. I’m still not totally in love with 1x drive trains because of the limitations at either end. The bike geometry, weight, stiffness, and surprising maneuverability were the selling points. Scott, what size did you go with and how tall are you? It comes from Intense with High Roller II’s, but there is a Schwalbe Nobby Nic on the front in the pictures. Which tire did you prefer, and why the swap? Do you know what the inseam measurements are on the taller test riders? I’m about 6′, but my inseam is around 35.” I’ve been looking at large frames that run larger. Thankd for the heads up on the sizing! I thought you were going to feature the x-fusion hilo sls on the carbine 29er? Or is the article exclusively going to talk about just the sls? I like your attention to details! The X-Fusion Hilo SLS is installed on the Carbine 29 currently and I just put some miles on it this evening. For the review above we rode the bike as spec’d by Intense with the RS Reverb. I want to log some serious miles on the SLS before writing about it, because as you likely know, all posts work well for the first few weeks…what makes a good one is how it responds to crummy conditions and how it works (or doesn’t) over time.